While American and Russian agents seek to exploit a recently discovered aquatic life form for their own purposes, a lonely mute woman falls in love with the creature. 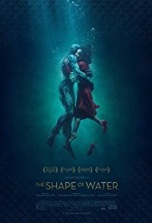 Del Toro, who brought us Pan’s Labyrinth, two Hellboy films and Pacific Rim, has perfected his craft with The Shape of Water (easily one of the most evocative movie titles ever), a Cold War, trans-species love story told through a skewed filter and delivered with a visual brilliance nearly unparalleled in recent cinema history. So let’s dive right in…Shape has many layers. If you think you’ve figured out what’s going on in the film’s text, there’s always the subtext to consider. The movie uses symbolism, thematic echoes, unexpected reverses, inverted stereotypes and modern parallels to great advantage. One conspicuous bit of symbolism involves eggs. Eliza Esposito (Sally Hawkins) uses an egg timer (in the shape of an egg) when boiling eggs and timing her activities in the bathtub, which also deals with reproduction (female eggs). When Eliza makes first contact with the creature, she gives it a hard-boiled egg as a gesture of friendship. Later, when she copulates with the dubiously compatible creature, Eliza consummates (literally and figuratively) the egg subplot, since having her physical needs met by another has freed Eliza from her tub prison (more symbolism). Eliza’s water habitat is the tub; the creature’s water habitats are the tube and pond. Eliza and the creature merge in three other bodies of water: her tub, her flooded bathroom and the bay of the ocean. Before we leave the egg timer metaphor, it’s worth mentioning that Eliza’s regimented existence is a reflection of our own in many respects, since daily routines and responsibilities (chores, shopping, cooking, working, paying bills, etc) can be their own special form of incarceration. Ironically, Eliza is just as much a prisoner as the creature is—freeing the creature will free her from her self-imposed prison of loneliness. There’s overt symbolism in the various reactions to the creature…when faced with the unknown, some will be filled with curiosity and others with fear (fight or flight). The conservative vs. liberal reactions to the creature are fairly transparent (and oversimplified) and reveal a clear bias against one of those political worldviews. Also clear is the movie’s pro-Russia, anti-America sentiment, which turns the Cold War on its head. American agents (particularly Michael Shannon’s Colonel Strickland) are loud, crass and aggressive, while the Russian agent (brilliantly underplayed by Michael Stuhlbarg, who, along with Shannon, was a cast member of HBO’s Boardwalk Empire) is reserved, calculated and sympathetic toward the creature. Strickland’s racist, nationalist, isolationist agenda is abhorrent and is a little too on-the-nose in its portrayal of adherents of the political party in question. Strickland is an angry man who’s in a loveless marriage; contrast his angry and messy love-making with the beautiful bathroom coitus between Eliza and the creature. Strickland also makes inappropriate advances toward Eliza, racist comments about Zelda Fuller (Octavia Spencer) and tortures the creature in his own, private Guantanamo (another political parallel). When the creature bites off Strickland’s fingers, the military man is more concerned with retrieving his severed digits than his wedding ring. His ring, and marriage by extension, isn’t precious to him (LOTR’s Gollum in reverse). All of this reveals Strickland, not the creature, as the movie’s bona fide monster. One curious side story involves Giles’ (Richard Jenkins) desire to matter in a world that’s passed him by. Giles painfully learns that he’s lived past his shelf date relationally (his attempts at wooing a young waiter implode) and occupationally (the sensibilities of his ad artwork have become outdated). This subplot touches on the ageism that exists in today’s job market and how marketing typically targets the youth of our society. As Eliza’s friend/neighbor/mentor, Giles serves a key role in the plot to extricate the creature. The message is clear; everyone has a part to play in the unfolding human drama. Though there are deeper zones to be explored in the film, this brief overview of the movie’s many layers of meaning should suffice in recommending it as an instant classic…and frontrunner for Best Picture. Directing- Del Toro has delivered a visual masterpiece, which effectively combines a Cold War thriller with a fantasy romance. The formalism on display here is truly staggering. Acting- The eclectic cast of top-tier performers (Shannon, Stuhlbarg, Jenkins, Spencer, David Hewlett and the brilliant Doug Jones) are completely upstaged by Hawkins’ mesmerizing, deeply-affecting portrayal of the lonely, lovelorn lead character. Story- The script by del Toro and Vanessa Taylor is equal parts fantastical, historical, meaningful and magical. The allusions to classical Hollywood movies are a nice touch; they tangibly tap into feelings of nostalgia for that era. When taken at face value, Shape is just a fantasy film. However, the story’s many aspects contain plot points that the viewer might not even be aware of—which makes the film such an enjoyable, and immersive, experience. Costumes/Make-up- The period appropriate costumes are well designed. The style of the creature’s costume hearkens back to the titular monster in Creature from the Black Lagoon (1954) and is brilliantly realized. Cinematography- While it’s del Toro’s vision that makes the film cohere, it’s Dan Laustsen’s brilliant framing that provides much of the movie’s visual wonder and beauty. Who will ever forget the flooded bathroom love scene? Music- Another exceptional score by Alexandre Desplat. Many of the cues written for Eliza’s character are whimsical and sublime. The underwater passages, where several flutes combine to produce an otherworldly effect, are moody and moving. Visual FX- Other than the underwater scenes there are very few visual effects in the movie. Production Values- Top-notch. Real world elements (with historically accurate detail) are seamlessly juxtaposed with fantastical elements (and even flourishes of the absurd like the refrigerator filled with slices of Key lime pie) to forge a wholly original world. Movie Magic- Immeasurable. The brilliant visuals, pitch-perfect performances, superlative directing, affecting accompaniment, multivalent story and period appropriate production elements all make for an unforgettable viewing experience.